I've been pounding the table on uranium for some time now. Over history, investors who have made the biggest gains have shown time and again that you need to buy when everyone else is selling. You need to buy what everyone else hates. You need to buy what no one else will. And ever since the earthquake-induced disaster at the Fukushima Daiichi nuclear plant, there have been few admirers of nuclear and uranium, and even fewer buyers. Indeed, though they had already been sliding from their June 2007 cycle highs near $137 per pound — spurred by the flooding of the Cigar Lake Mine — after the tsunami and subsequent shuttering of all 48 reactors in Japan, the bid simply disappeared from under uranium spot prices. Ultimately, uranium spot prices fell all the way to $28 per pound this past summer, a level not seen since May 2005. Uranium prices at these levels are unsustainable. They must go higher. When they do, uranium stocks will move much higher as well. And the companies with proven deposits boasting high grades and shallow depths will move higher by many multiples. That's the natural cycle of things. You just have to be aware of it and be willing to buy a hated sector in anticipation of the profit cycle changing direction. For example, when uranium prices spiked over 400% from 2005 through 2008, junior uranium miners and exploration companies added as many percentage points, or better. Again, when uranium spot price rebounded by 47% in 2010 and 2011, uranium mining stocks soared even higher. Now, we're on the verge of the cycle turning over once more. For starters, global electricity demand is growing twice as fast as overall energy demand. Worldwide demand for electricity will rise 75% by 2035. A lot of that will have to be met with new nuclear plants, and we're seeing early signs that countries are well aware of it. Nowhere is this more obvious than in China. 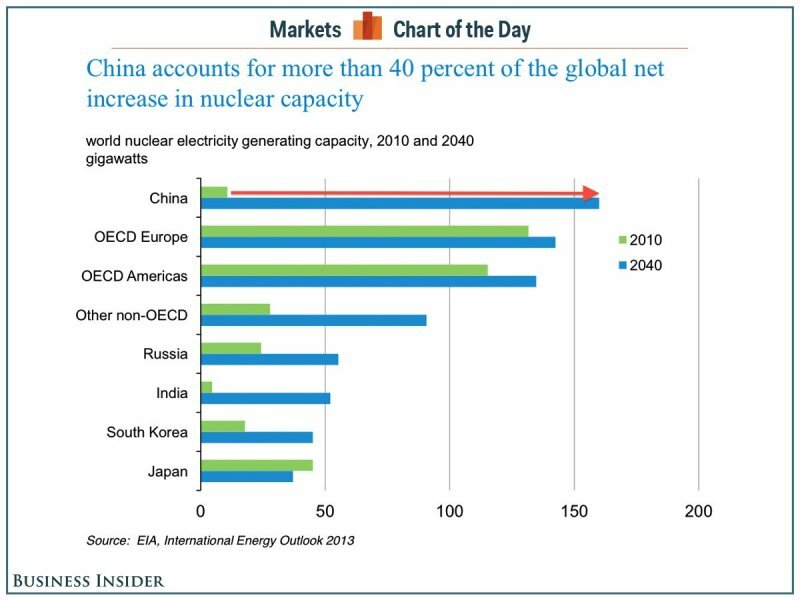 China currently has 17 nuclear reactors online and another 28 in the works. All told, the World Nuclear Association expects China to quadruple its nuclear reliance by 2020. 15 to 160 gigawatts is a 967% increase! That's some astounding growth, and a black swan event like Fukushima is not going to put a dent in a transition that massive. It probably won't even dent growth of Japanese demand. The country is already removing bans on nuclear power as it faces reality. It can't keep the lights on without nuclear power. I honestly don't know when the momentum will truly shift. I just know it has to, or utilities won't be able to sustain 14% of global electricity production. When I look at a theme now like uranium, I am perfectly comfortable with the fact that it might take 5 years to be right. I have come to learn that asking myself investment questions where the answer begins with when, not if, is a very good trade. In the uranium business now, industry costs including cost of capital is about $70, so you produce for $70 and sell it for $30 and lose $40. You cannibalize existing capital in corporate vehicles and that goes on until they go broke, and then the price shoots just like it did last decade. That’s a question that begins with when. When does the dam break? It’s not if. Does the price of uranium go up or do the lights go out? With no Japanese demand and high supply from decommissioned nuclear warheads, nobody wanted to be the first to buy. Exelon (NYSE: EXC) is the largest nuclear utility in the U.S., which is the largest nuclear power market in the world. It recently started buying large quantities of uranium at the bottom of the market. That goaded buying interest in other utilities like Southern, Duke, and FPL. As a result, uranium spot prices have now surged 40% off their summer lows of $28/lb to nearly $40/lb. And can you guess what uranium stocks are doing? But none of those in the chart have added the same 40% that uranium spot prices have. They still have some catching up to do. And uranium prices could still have further to go. Remember, uranium spot prices were at $39/lb in March 2006 — exactly where they trade today. By the end of 2006, the spot price reached as high as $66/lb, before peaking near $140 the next year. Uranium stocks returned thousands of percent during that period. And could be on the cusp of doing so again. Uranium price rise is accelerating. Spot uranium prices jumped up another $2/lb yesterday to $39/lb U3O8 according to TradeTech, or $39.25 according to UxC. Spot is now up 40% since lows of $28/lb this summer. Most importantly, it is the utilities that are starting to enter the market, suggesting that this rally could have some sustainability. ...the thing that might make this sustainable is that the utilities are starting to buy, in addition to the intermediaries and financial entities that are buying. Trading is still thin, but the makeup of the bidders has changed a lot recently and sellers are getting less needy to sell. The utilities need to purchase both spot and term uranium, and cover for 2017-18 period in particular. While they may be coming in early for that period, it is easier to talk its management into buying in rising uranium markets than flat. We have always said, just like in 2006-2007, when contracting begins and the price moves, it will move fast. Now is the time to buy uranium stocks — just as the cycle starts to move higher. Even if it doesn't fully happen in 2015, I'm perfectly happy waiting an extra year or two for multi-hundred or thousand point gains. Remember, the return of uranium to a massive bull market and profit cycle is a when, not an if. Nick is the Founder and President of the Outsider Club, and the Investment Director of the thousands-strong stock advisory, Early Advantage. Co-author of two best-selling investment books, including Energy Investing for Dummies, his insights have been shared on news programs and in magazines and newspapers around the world. For more on Nick, take a look at his editor's page.